Matamela Cyril Ramaphosa is a South African politician, businessman, activist, and trade union leader. He is the 5th President of the Republic of South Africa and following the resignation of President Jacob Zuma, he was sworn in as President of the Republic of South Africa on Thursday 15 February 2018. Ramaphosa was born on the 17th November 1952 to Erdmuth and Samuel Ramaphosa in Soweto South Africa. He is from the Venda tribe, one of the smallest tribes in South Africa. Cyril Ramaphosa was born on the 17th of November 1952. He is 66 years old as of 2018. He had been married to late businesswoman Nomazizi Mtshotshisa and together they had a daughter but the couple divorced. Ramaphosa is married to Tshepo Motsepe who is a medical doctor and the sister of billionaire and mining magnate Patrice Motsepe. Ramaphosa is known to have four children. A daughter with his late ex-wife and four other children. He is one of the richest men in South Africa, with Forbes estimating his wealth at over $700 million. He owns a R30 million luxury mansion at the foot of Lions Head located in Cape Town. Ramaphosa is known to be one of the richest people in South Africa, with an estimated net worth of over $500 million making him one of the richest politicians in South Africa. He owns a luxury mansion worth R30 million at the foot of Lions Head Cape Town. He established the Shanduka Foundation in 2004, whose major focus was centered majorly on education and small business development. The Foundation, which is known as Cyril Ramaphosa Foundation, comprises of Adopt-a-School Foundation, Black Umbrellas and the Cyril Ramaphosa Education Trust. He is co-chairperson of the Advisory Board of the Kagiso Shanduka Trust, which is in partnership with the Free State Department of Education on a programme to develop schools in the province. 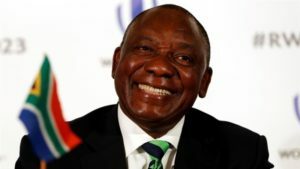 Ramaphosa has received honorary doctorates from the University of Natal, the University of Port Elizabeth, the University of Cape Town, the University of the North, the National University of Lesotho, National University of Ireland Galway the University of Massachusetts Boston and the University of Pennsylvania. Ramaphosa received the Olof Palme prize in Stockholm in October 1987. In 2004, he was voted 34th in the Top 100 Great South Africans. Ramaphosa was included in the 2007 Time 100, an annual list of 100 men and women whose power, talent or moral example is transforming the world. Cyril Ramaphosa news will be updated here shortly. South Africa’s new president Cyril Ramaphosa earns a salary of $252,700 annually making him one of the highest paid leaders in Africa. Ramaphosa publicly declared in South Africa on 24 May 2018 that he would be donating half of his salary to charity in honor of late former South African president Nelson Mandela.